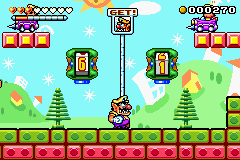 The Big Board is the second level of the Topaz Passage in the Game Boy Advance game Wario Land 4. The Big Board is a gameboard themed stage and it is the second level of the Topaz Passage. This is the only level in the game to feature the chance wheel, which will assist Wario in progressing throughout the level by providing items or objects. The very last chance wheel provides the Keyzer for that level. The stage has an inside and an outside area, both of the backgrounds look like they were hand drawn. This level's CD is called The Short Futon and once collected, it can be played in the Sound Room. The shrubs and flowers found on the foreground at the start of the level bear a seemingly intended resemblance to actual Lego parts. Their artwork style is slightly distinct. : the time given is 3:00.
: the time given is 2:30. (unlockable): the time given is 2:00.